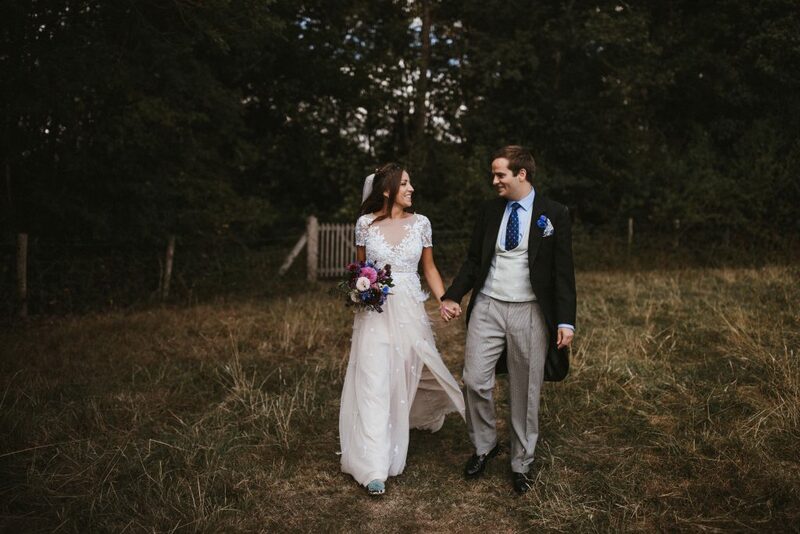 Back at the end of June I met with Claire in her parents sunny back garden a stones throw from her wedding venue, the stunning Falconhurst Estate. She had huge dreams for a flower filled day, with vibrant colours and sensational displays. I set about creating the most incredible wedding flowers for her, ensuring it was everything she had hoped for and more. Her colour scheme was honestly to die for… bright, dark and vibrant, with strong pinks, purples, burgundy/almost blacks and blues. In a sea of blush and pink, it was an absolute breath of fresh air! 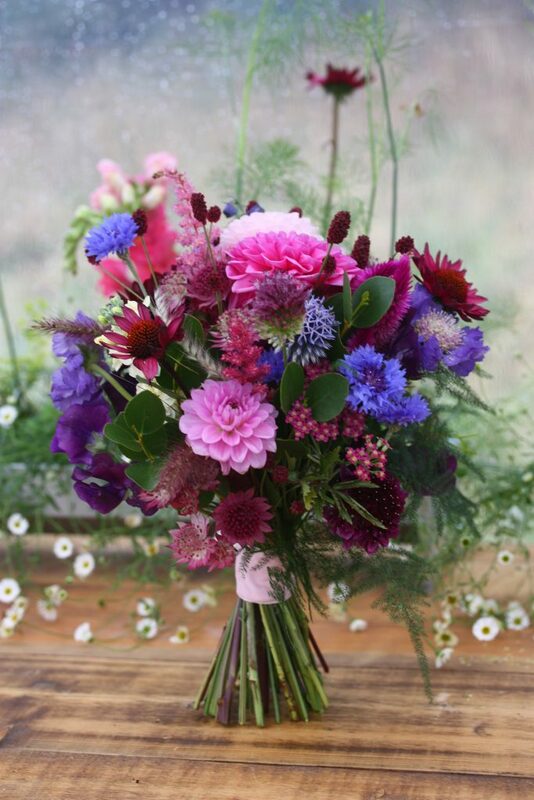 I ordered in as many gorgeous blooms as I could set my hands on including Dahlia, Scabious, Alliums, Cornflower, Delphinium Larkspur, Sweet Pea, Grasses.. there was so so much! Then again it was my biggest wedding to date and I really didn’t want to disappoint! Claire wanted her bridal bouquet to be wild, effusive and definitely not round! 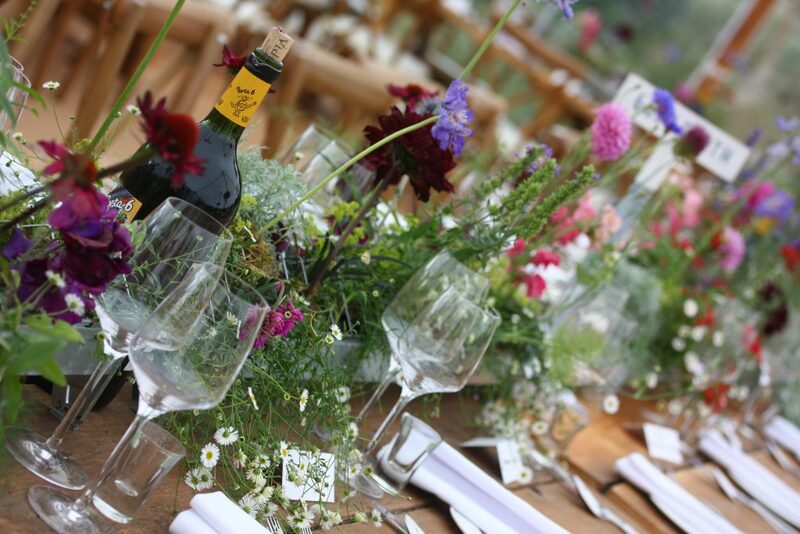 It was brimming with an array of stunning Dahlia, Allium, Rudbeckia, Sweet Peas, Cornflower and many more. Grasses and Asparagus Fern softened the edges giving it a fluffy, feathery and wispy feel. My absolute favourites were the Karma Choc Dahlias, the Chocolate Cosmos and the Rudbeckia, they really made the bouquet for me! Falconhurst was the perfect venue for Claire, so close to her family home. The beautiful gardens hosted the happy couples drinks and canape reception, before the guests we led to the huge Shades marquee in the grounds. 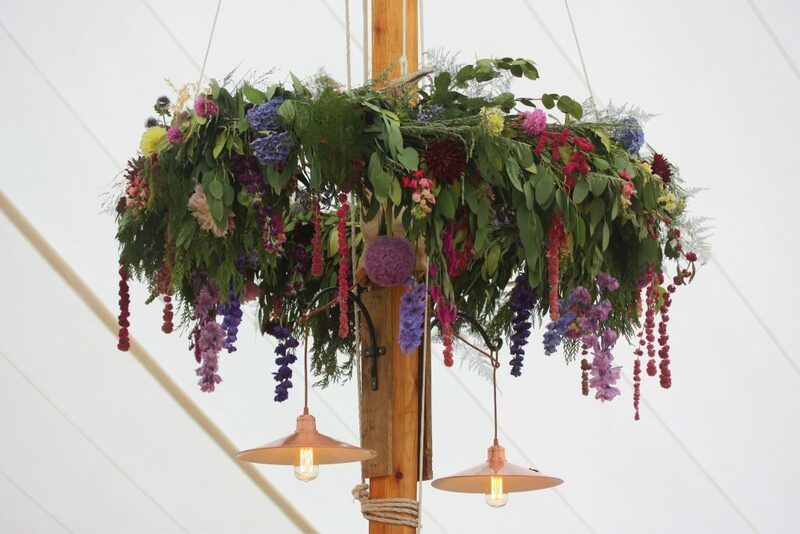 The marquee was absolutely packed full of flowers from floor to ceiling. I couldn’t have done any of it without the help of my incredible right hand-lady Kate (The Floral Magpie). Between us we created four 12ft hanging hoops, that were hoisted by the ever so lovely Dave from Shades in the 35C heat! It is not a day any of us will forget in a hurry, especially when the thunder and lightning started! 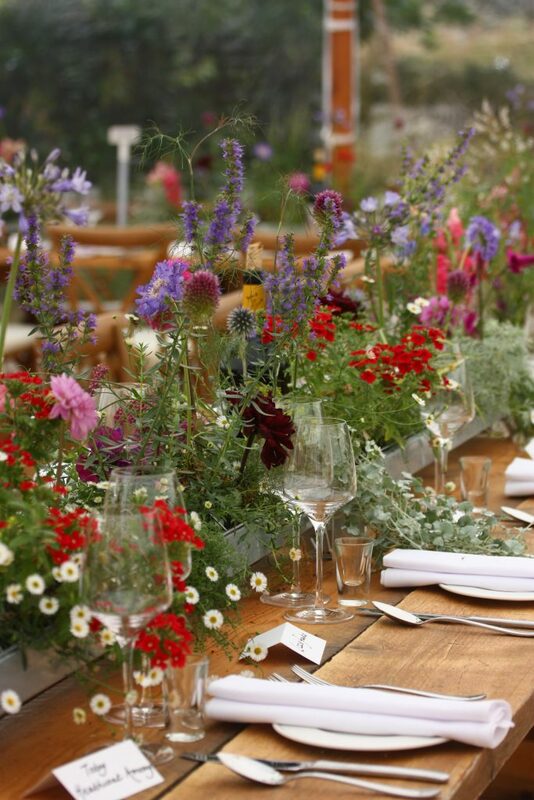 Claire had the most incredible vision for the long trestle tables and Mum Linda was tasked with planting up 45ft of chicken feeders! She put blood, sweat and tears in to them in the hottest weather we’ve had in ages! We’ll you can see the results and it was totally worth it! Kate and I filled them out with hundreds of flowers to give the look that Claire had dreamed of. I was totally blown away, they were absolutely sensational! Then the icing on the cake (as they say) was this showstopper from Hannah Hickman Cakes. 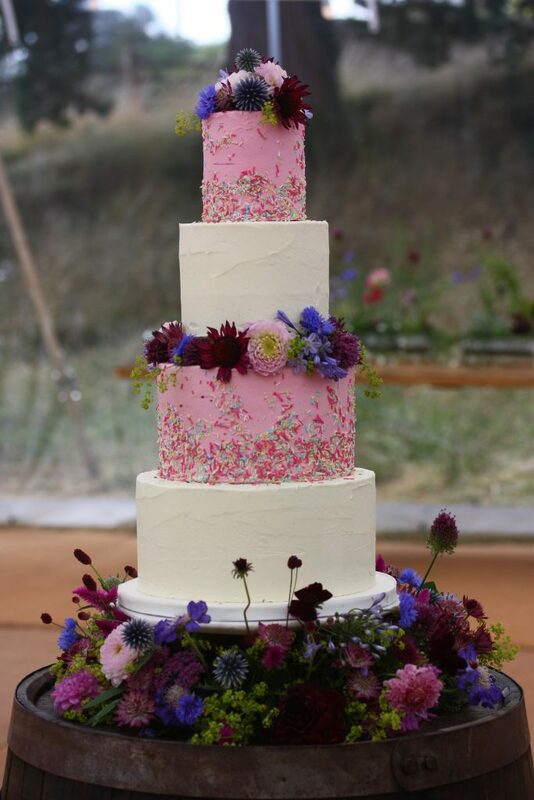 A 4-tiered masterpiece with delicious buttercream and surrounded by flowers, what more could a girl want?! I have to say Claire and Ricky’s wedding was an absolute dream. Claire had such wonderful style, a great colour scheme and she has to be one of the loveliest brides I have ever worked with. I feel very lucky to have been given such an incredible opportunity! I’ll leave you with Claire’s words about her amazing day..
Rebecca, thank YOU so much for the flowers – I can’t tell you how grateful Ricky and I were to see the marquee – It was simply stunning! I absolutely loved my bouquet and the Bridesmaids flowers – Honestly, I couldn’t have wished for anything more. 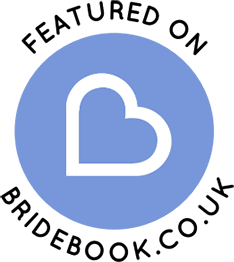 Thank you for all your hard work! Just amazing!